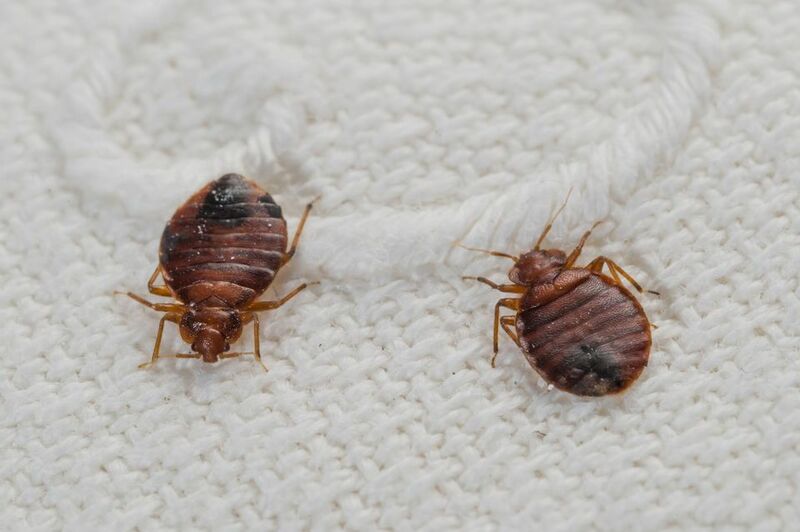 Bedbugs have been documented since the early Egyptian culture and are found around the world. They are good hitchhikers, and an infestation can begin with just a female caught in luggage, clothing, or upholstered furniture. While there is no evidence that bedbugs transmit diseases, they do bite and leave irritating, often itchy, bumps. Pesticides will be needed to control extensive infestations, but there are some things you can do, like handling laundry correctly, that will help prevent or control the problem. If you are concerned about bringing home bedbugs after traveling, empty your suitcase outside or in the laundry room. Immediately wash the clothes in the suitcase or seal non-washable clothes in a black plastic bag to take to the dry cleaner. Then, place the empty suitcase in a black plastic bag and seal tightly. Leave the bag sealed for at least 14 days. If possible, place the bag in the sun or in the trunk of a car that gets plenty of exposure to heat. The minimal temperature for eradicating the bugs is 113 degrees F. After the 14 days, vacuum and clean well before bringing the suitcase back into your home. Every professional is going to tell you to first vacuum every crack and crevice in your home to get rid of the bugs. Then wash all washable fabrics in hot water and dry on high heat. High temperatures (120 F or above) will kill all stages-nymph to adult-of bedbugs. This is the ideal solution for bedbug removal from bed linens and some garments. But what if you have items that should not be washed in hot water or dried on high heat? There are alternative treatments. The Sun and a Plastic Bag: If you have items that should not be washed in hot water, the sun can do the work for you. Place infested items loosely in a large, sealable plastic bag. Place the bag in direct sunlight and leave for several hours. Use a digital thermometer to check the temperature in the bag to be sure it has reached the 120 F required to kill all stages of bedbug development. Clothes Dryer: Items that are labeled dry-clean only can be placed in a clothes dryer on medium-high (160 F) for 10 to 15 minutes. This length of time should not be harmful to silk, wool, cotton, linen, rayon, nylon, or polyester blends. When the cycle is finished, carefully bag the dryer's lint trap and take it outside to empty. Dry Cleaning: Dry cleaning by a professional cleaner will kill bedbugs. But, it is very important that you inform the cleaner of the problem when you bring in items. This will prevent infestation of bedbugs spreading to others. Warm Water Soak: For delicate items like lingerie, allow them to soak in warm water with plenty of laundry detergent for several hours and then wash as usual to remove the bedbugs. Freeze Time: Bedbugs cannot live if subjected to temperatures below 32 F for several days. Infested items can be bagged and frozen. The downside is that most home freezers fluctuate in temperature and often rise to 40 F during defrost cycles. However, if you have access to a freezer or weather with constant frigid temperatures, this will do the trick. Why Did We Get Bedbugs Again? If you have survived a bedbug infestation and you have continued to wash all of your bed linens in hot water and dried them with high heat, the risk of catching bedbugs again through shared washers and dryers is minimal. However, not all laundry can be washed or dried at high heat. And, you don't know what temperature the person in front of you used in the washer or dryer. Some bedbugs and bedbug eggs can survive a cold water wash. Then, if you decide to air dry or use a low heat tumble cycle, the bedbugs can infest your clothing and get back into your home. Whatever method you use, be diligent. Bedbugs are stubborn insects, and you may need to take precautions for several months to be sure that you have gotten rid of every single one. One step to prevent infestation is to encase your bedding - box springs, mattress, and pillows - in bedbug barrier kits. You can purchase bedbug protection kits which also help to reduce allergies. Can I Get Bedbugs from a Laundromat or Shared Laundry Room? The rumors are swirling. One of your neighbors in the apartment building has bedbugs, and you share a laundry room. Can you end up with an infestation too? Unfortunately, the answer is yes. Should you skip the apartment's laundry room and head to a commercial laundromat? It doesn't matter where you end up doing your laundry. There is a small risk that your laundry can become infested from doing laundry in a laundromat or communal laundry space if others have bed bug laundry. The chance is minimal, but it is there. What Can I Do to Prevent Bedbug Infestation from the Laundromat? The biggest threat of catching bedbugs from a communal laundry room comes from shared equipment, especially rolling laundry carts made from canvas. If you know or suspect that bedbugs could be present, take your clothes to the laundry room in your own hamper and don't leave it sitting around. When the clothes are finished, take them back to your apartment to fold. Spread a clean white sheet on the table, floor, or bed under the fresh clothes being folded. The sheet will help you see any critters that might fall from the fabric. Do your best to stay with your clothes or get back to the laundry room on time to prevent someone else from handling your clothes. If you are concerned about the cleanliness of the washers, run an empty cycle with hot water before starting your clothes. You can do the same thing with the dryer by running a cycle on high heat with no clothes. When you empty the dryer lint screen, place the lint in a plastic bag and dispose of it away from your clothes. What Do These Laundry Symbols Mean? Is it Time to Wash Your Tennis Shoes?